Trees and other plants help keep the planet cool, but rising levels of carbon dioxide in the atmosphere are turning down this global air conditioner. According to a new study by researchers at the Carnegie Institution for Science, in some regions more than a quarter of the warming from increased carbon dioxide is due to its direct impact on vegetation. 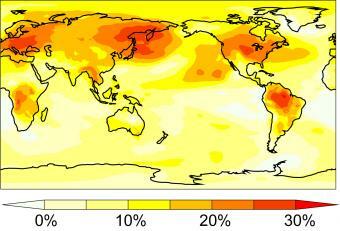 This warming is in addition to carbon dioxide’s better-known effect as a heat-trapping greenhouse gas. For scientists trying to predict global climate change in the coming century, the study underscores the importance of including plants in their climate models.